Chicago, Illinois (March 29, 2017) – Artisanal Imports is excited to announce that it has partnered with Dovetail Brewery of Chicago, Illinois to be its sales and marketing partner beginning in April. “We got into this business to make great beer and we’ve had some very nice initial success. At this point, we feel it’s time to bring on a dedicated sales force to let us focus on what we do best,” said Dost. Similarly, Artisanal Imports felt Dovetail Brewery was a natural addition to its beer family. In the past couple of years, the company has expanded its portfolio to include several established Belgian and Bavarian breweries, so incorporating a domestic producer that also produces these high-quality traditional ales felt right. “We love to bring new beverage experiences to the market, and we feel Dovetail and its beers deserve to be enjoyed by a wider audience,” said Sean Knoll, President of Artisanal Imports. “What’s impressive about Dovetail is that its beer exhibits a depth of flavor and nuance that generally takes years, or even generations to refine, yet they have been able to accomplish that level of complexity in a relatively short period.” In addition to sharing a similar taste in beers, “we share [Dovetail’s] vision of pragmatic and responsible growth,” said Knoll. While Dovetail is already receiving demand on a national level, the Artisanal partnership is focusing on responsible expansion to ensure the brewery is doing what’s best for the quality and consistency of the beer. The immediate goal is to build the brand locally and expand out as production allows. In the short-term they will focus heavily on sales in Chicago to maintain a realistic distribution area. The Chicago suburbs will follow and then a select few metropolitan areas in the nearby region. Currently, Dovetail beer is sold in the brewery’s tap room and sold wholesale by the keg to bars and restaurants near the brewery, located in what has become known as Chicago’s Ravenswood Brewery Corridor. Do you operate a restaurant, bar or retail store in Illinois and would like to sell Dovetail beer? Interested in commercial samples for review? Please contact Lanny Hoff with interest. 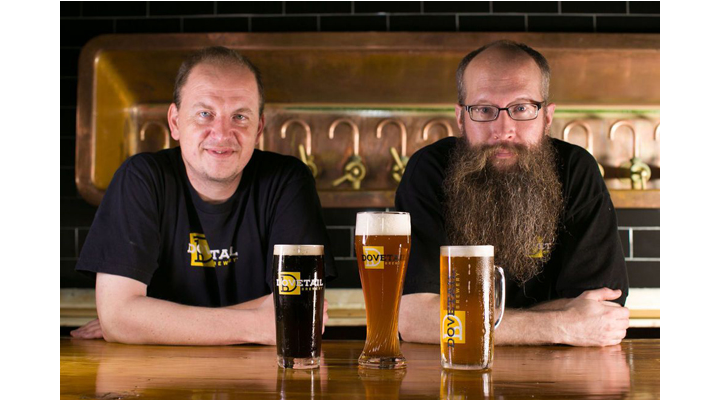 For interview opportunities with co-founders Hagen Dost and Bill Wesselink, or for more information about Dovetail Brewery and this emerging German and Belgian inspired Chicago brewery, please contact Lanny Hoff at +1 (612) 245-5433 or by email at lanny.hoff@artisanalimports.com. About Dovetail Brewery: Located at 1800 W. Belle Plaine in Chicago, Illinois, Dovetail Brewery is a craft brewery owned by master brewers Hagen Dost and Bill Wesselink which specializes in delicious, balanced beers using traditional German and Belgian brewing methods. Signature beers include unfiltered German-style lagers, traditional Hefeweizen, Rauchbier and Lambic-style sour beers. Dovetail Brewery also produces a variety of special seasonal beers.